I’ll wear your skin as business, not because I want to become you, but because I don’t know what it’s like in spring without your face: the droop, the sag around sockets, mouth hung in a limp sneer; a puffy grin to grab skin. In snowfall lightly pondering dissection. Machine sounds and the smell of meat. Our family tradition. We laugh grime. I’ll make you not want to leave. The table is set. Fingernails. It’s a hoot: blonde, open-throated, of course. Hear the rev of how blades whir, sounds mealtime, meat platters. The sound of skin and hooks. I’ll fit you in the freezer, make a noise album out of your thump. Fists become bass. Hooks are needles. I once made a VHS mix for a friend that began with The Texas Chainsaw Massacre, ended with a low-brow, low-budget classic goofball horror film (too unexpectedly comedic for his tastes at the time) about a group of teens and how the elderly are woken from the grave. To kill. The juxtaposition offended his sensibilities, respectfully. I was woeful. My love for how horror reaches the level of the absurd. I’m thinking Dennis Hopper here. I’m thinking the ghosts of chubby men in suit coats chasing after pick-up trucks. Or ships swallowing blood over water. A sun sinking behind hills at dusk. You use this word, “sink,” but the sky is more like a drip. Or a lingering flinch. This horror lingers out from how you will go on to write fear to life. 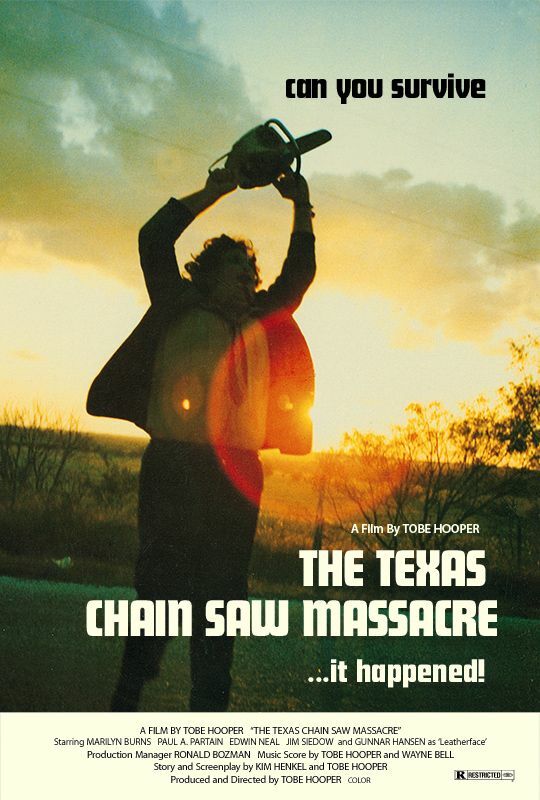 A conjuration of Tobe Hooper. Of massacres in Texas. You want to sing the sequels (the spin-offs, the remakes), but it’s this original that slices off the tips of your fingers, glues them back over your ears when you write. Seven slices of ham. Livers soaked in Merlot. Ice on a branch. Sheep shank. A winding dirt road that leads to a school. Fields of rice. Locust. Tartar. We’re making sausages. A fleshy smear around the potatoes. Orange fabric. A tablecloth. A pinch of goat. Opening the throat to scream. She’ll scream for thirty minutes. You will expect it. A summer evening. White sheets. We’ll eat the floorboards. Tongues are boiled soliloquies. Hair of the father. Marinate bones. Break bones to make merry. And we’re terrified to be here.